Helen Clark, patron for the new Religious Diversity Centre in Aotearoa New Zealand, launches the centre in Wellington. Former Prime Minister Helen Clark says New Zealand can provide a model of religious diversity for the rest of the world. Miss Clark, who heads the United Nations Development Programme, said this at the opening of the new Religious Diversity Centre in Wellington on Wednesday 30 March, while home briefly in New Zealand. Hon Christopher Finlayson (National), MP Su’a William Sio (Labour), and MP Marama Davidson (Green) hosted the launch in the Grand Hall of New Zealand Parliament. Miss Clark is patron of the centre. She said our world badly needs such models as New Zealand. ‘On so many days now when I see the news headlines I often think how fortunate we are. Miss Clark said the role of faith-based actors had special significance in those parts of the world where governance structures were weak and the state could not give access to basic services like education, justice, health and security. She said the UNDP acknowledges the role of the faith actors in local communities. Faith organisations often deliver critical services. Faith leaders can mobilise grassroots support and earn the trust of vulnerable communities. The Religious Diversity Centre will be a national centre of education and research on religious diversity, spiritual and secular communities in New Zealand. It will provide advice to policy makers and the media, and offer training for companies, media and others. The trustees responsible for establishing the centre include Jocelyn Armstrong, multi-faith educator; Kevin Clements, director of the National Centre for Peace and Conflict Studies at Otago University; Jenny Te Paa Daniel, public theologian; and Paul Morris, professor of religious studies at Victoria University. 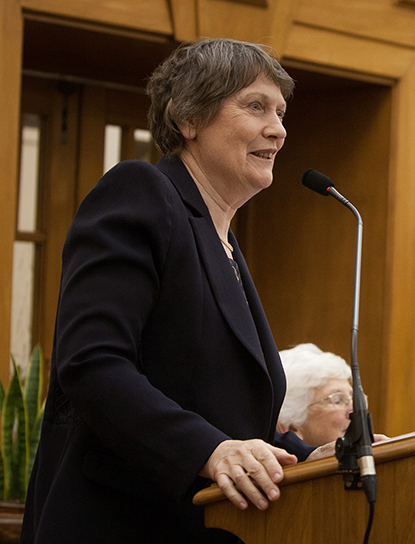 As Prime Minister, Helen Clark supported New Zealand’s National Statement on Religious Diversity first published in 2007 and was instrumental in New Zealand becoming one of the four sponsoring nations of the Regional Interfaith Dialogue that involved 15 Asia-Pacific countries. The bishops also affirmed the right to celebrate and share faith in this country’s democracy. They pointed out that Governor Hobson committed the Crown to enduring respect for the freedoms of different faiths at the signing of the Treaty of Waitangi in 1840. In response to a question from Catholic Bishop Pompellier, Governor Hobson said he would protect and recognise not only the major western religions, but also Maori customary beliefs and practices. Today, New Zealand is recognised to be one of the most religiously diverse countries in the world, at 19th out of 232 countries.